Third UNKNOWN. Third married Marie JONES. Marie JONES [Parents] was born in 1913 in , Conway, Arkansas. Marie married Third UNKNOWN. Shadrach M. JONES [Parents] was born on 16 May 1810 in , , Tennessee. He died on 28 Jun 1887 in Griffin Flat - Appleton, Pope, Arkansas. Shadrach married Mary "Polly" GEORGE on 9 Oct 1834 in , Franklin, Indiana. Mary "Polly" GEORGE was born on 30 Jul 1819 in Ray, Franklin, Indiana. She died in 1860 in , Conway, Arkansas. Mary married Shadrach M. JONES on 9 Oct 1834 in , Franklin, Indiana. F i Eleanor JONES was born on 30 Sep 1835. She died on 4 Nov 1856. M ii William Calvin JONES was born on 8 Sep 1837. He died on 31 Jul 1879. Iva B. JONES was born about 1839 in , Pope, Arkansas. M iv Preston Festus JONES was born in 1840. Luther Irdell JONES was born in 1842 in , Conway, Arkansas. He died in 1860 in Griffin, Conway, Arkansas. F vi Nancy A. JONES was born on 18 Feb 1845. She died in 1860. James J. JONES was born in 1848 in , , Arkansas. Elisha JONES was born in 1850 in Griffin, Conway, Arkansas. He died in 1860 in Griffin, Conway, Arkansas. Mary E. JONES was born in Jun 1851 in , Conway, Arkansas. She died in 1860 in Griffin, Conway, Arkansas. M x Abraham Cass JONES was born on 2 Apr 1853. He died in Dec 1897. M xi Shadrach A. JONES was born in 1853. He died on 1 Oct 1881. Caroline JONES was born in Feb 1855 in , Conway, Arkansas. M xiii George Buchanan JONES was born on 5 Oct 1856. He died on 19 Oct 1936. Patrick G. SWEEDEN was born in 1832 in , , Alabama. He died in 1874 in Appleton, Pope, Arkansas. Patrick married Eleanor JONES on 13 Nov 1853 in , Pope, Arkansas. Eleanor JONES [Parents] was born on 30 Sep 1835 in , , Tennessee. She died on 4 Nov 1856 in Conway, Arkansas. Eleanor married Patrick G. SWEEDEN on 13 Nov 1853 in , Pope, Arkansas. M i Thomas Henry SWEEDEN was born in Nov 1854. He died on 7 Jun 1931. William Wilson RANKIN [Parents] was born in Jan 1858 in , Pope, Arkansas. He died in 1929 in Dozier, Collinsworth, Texas. William married Mary Jane JONES in 1886. Mary Jane JONES [Parents] was born on 12 Oct 1866 in Appleton, Pope, Arkansas. She died on 9 Mar 1940 in Dozier, Collingsworth, Texas. Mary married William Wilson RANKIN in 1886. Ruby Ethel RANKIN was born in 1887. Effie RANKIN was born in 1887 in , , Arkansas. Reuben RANKIN was born in 1889 in , Conway, Arkansas. John RANKIN was born in 1891 in , , Arkansas. Willie RANKIN was born in 1892 in , , Arkansas. Ruth Ellen RANKIN was born in 1894 in , , Arkansas. Corrie Elizabeth RANKIN was born in 1897 in , , Oklahoma. Fay RANKIN was born in 1897 in , , Texas. Preston Festus JONES [Parents] was born in 1840 in , Conway, Arkansas. He died in Griffin, Conway, Arkansas. Preston married Mary A. WALLACE on 24 Dec 1886 in , Conway, Arkansas. Mary A. WALLACE was born in 1871. Mary married Preston Festus JONES on 24 Dec 1886 in , Conway, Arkansas. UNKNOWN. UNKNOWN married Amber MOODY. Amber MOODY. Amber married UNKNOWN. Raegan Grant MOODY was born on 8 Oct 1996 in , Pope, Arkansas. Shadrach A. JONES [Parents] was born in 1853 in , Conway, Arkansas. He died on 1 Oct 1881. A. C. JONES was born on 2 Apr 1853 in , Pope, Arkansas. John MENDENHALL [Parents] was born on 5 Sep 1770 in New Garden, Guilford, North Carolina. He died on 6 Sep 1844 in Vefrsailles, Ripley, Indiana. John married Ruth. Ruth. Ruth married John MENDENHALL. Abraham Cass JONES [Parents] was born on 2 Apr 1853 in , Conway, Arkansas. He died in Dec 1897 in Griffin Flat, Conway, Arkansas. Abraham married Mary Evelyn FREEMAN. Mary Evelyn FREEMAN was born in Mar 1854 in , , Arkansas. Mary married Abraham Cass JONES. William Jefferson JONES was born on 11 Mar 1869 in , , Arkansas. He died in 1937 in Jerusalem, Conway, Arkansas. Flora E. JONES was born in 1877 in , , Arkansas. Richard W. C. JONES [Parents] was born in 1740 in Bristol, Prince George, Virginia. He died in 1805 in , Robertson, Tennessee. Richard married Martha WARD on 15 Nov 1774 in , Amelia, Virginia. Martha WARD was born in 1755 in , Amelia, Virginia. She died on 25 Sep 1823 in , Davidson, Tennessee. Martha married Richard W. C. JONES on 15 Nov 1774 in , Amelia, Virginia. Margaret JONES was born in 1775 in , , Virginia. Martha JONES was born in 1775 in , , Virginia. She died in 1847 in Wilson, Tennessee. John Wilson JONES was born in 1777 in , , Virginia. He died in 1823. Thomas Batte JONES was born in 1779 in , , Virginia. M v Jonathan Abram JONES was born in 1780. He died in 1840. Dorothy Chamberlain JONES was born on 10 Nov 1783 in , Amelia, Virginia. She died on 11 Mar 1851 in Elkton, Giles, Tennessee. 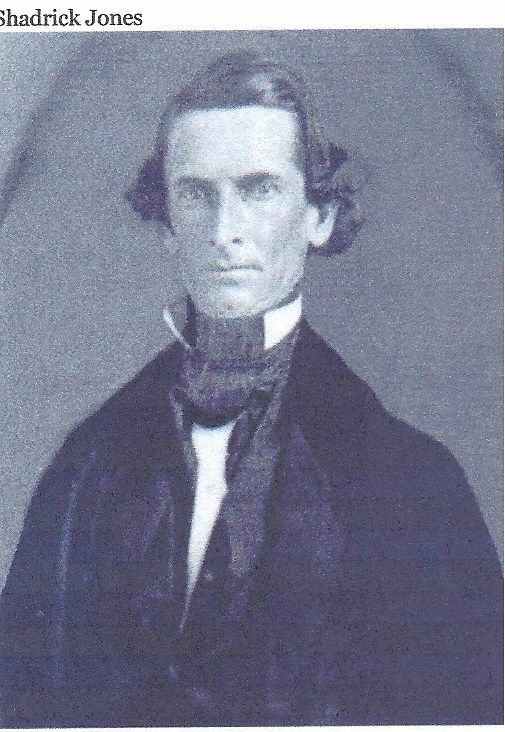 Richard H. JONES was born in 1784 in , Amelia, Virginia. He died in 1823.